For an aspiring astronaut, the skies over Alaska maybe the ultimate testing ground. 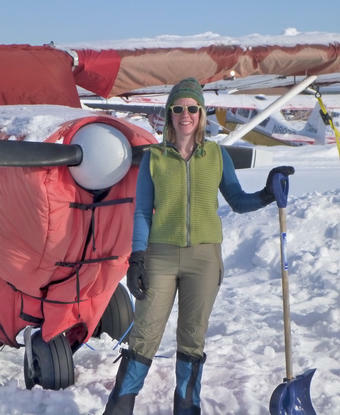 In seven years of flying across the Last Frontier State, Jessica Cherry ’00, GSAS’07 has crash-landed a plane on snow after its wheels refused to descend and switched fuel tanks after the first one clogged with ice. “I don’t necessarily fly at 40-below anymore,” she says, of the many lessons she has learned flying in environments as close to space as you can get without leaving Earth’s gravitational pull. Cool under pressure and exceptionally determined, Cherry has marshalled her skills as a commercial pilot and research scientist into a potential career in space. In 2013, she made it to the final round of NASA’s astronaut-selection process. Though not among the 10 candidates chosen, Cherry refused to give up. Instead she joined a private astronaut agency in Houston, Astronauts4Hire, which plans to send scientists and engineers into space. Missions could include ferrying supplies to the International Space Station or carrying out NASA research. Jessica Cherry ’00, GSAS’07 takes a break after digging out her plane from a snowstorm in March 2012. Calling Cherry a scientist who flies planes is like calling Indiana Jones a professor who dabbles in antiques. Instrument-rated, she is certified to fly at night and through clouds; she can roll and fly upside down; and she knows how to escape an underwater wreck and stay conscious under rocket-like, or “high-g,” accelerations — all skills that might one day serve her well in space. Already her resume fills 12 pages. As a senior researcher at the University of Alaska, Fairbanks, Cherry studies the state’s changing snow cover and permafrost to understand whether the region will grow wetter or drier as climate warms. The state is too vast, with too few roads, to get a good read on conditions by foot; details beamed from satellites are too coarse. Planes, she says, offer that “perfect in-between vantage point.” After moving to Alaska in 2007, Cherry took up flying lessons and discovered she loved the feeling of sitting in the cockpit, fully in control. “I spent a lot of time on ships all over the Arctic, but I found that I like something smaller and more maneuverable that I could drive myself,” she says. Cherry earned her commercial pilot’s license, bought her own plane — a four-seat, single-engine Cessna — and started a data-gathering business that she runs with her husband, Bob Busey, in her off-hours. Busey is an engineer at Alaska and their company, Northern Science Services, gathers aerial pictures and airborne measurements for NASA, the National Science Foundation and the Jet Propulsion Laboratory, among others. In a field dominated by men, Cherry’s calm, take-charge approach inspires confidence in those around her, says her husband. “When you work with determined people, they show you the way or you just follow them,” he says. Growing up in Lincoln, Neb., Cherry was exposed to art and science by a mother who painted and a father who was a surgeon. Drawn to nature at an early age, she remembers memorizing the names of prairie grasses edging her grandfather’s farm. A high school chemistry teacher steered her toward science but it wasn’t until Columbia and a pivotal semester in the Arizona desert at Biosphere2 that the subject became her focus. For several years, Columbia ran Biosphere2 as an education and research outpost, a self-contained world designed to mimic Earth, with its own rainforest, coral reef and savannah. Fascinated by what she learned there, Cherry pursued a double concentration in earth and environmental sciences and economics. Outside of class, she worked a series of odd jobs — bartending, selling paintings at a SoHo gallery and analyzing weather patterns for a Wall Street bank — before deciding to stay at Columbia to study for her Ph.D. at Lamont-Doherty. As a master’s student in oceanography, Cherry spent several years traversing the Arctic on U.S. and Russian ice-breaking ships before deciding that research on land suited her more. She switched to hydrology and climatology for her Ph.D., and, among other projects, established the first instruments to measure snowfall at Black Rock Forest, near West Point, N.Y.
After finishing her degree, Cherry flew west to take a research position at Alaska, where she met Busey, a native Alaskan who shared her passion for extreme environments. After spending their honeymoon on Baffin Island, above the Arctic Circle, they settled down in a log cabin where approaching guests often encounter moose in the driveway. When not in the air, Cherry can be found cross-country skiing, growing and cooking local food, and translating her curiosity about Arctic cultures and other topics into film and prose. She is working on two books of essays describing her experiences at sea and in the air. View a video of Cherry explaining why smog builds up in winter over Fairbanks, Alaska. Kim Martineau JRN’97 is a science writer at Lamont-Doherty Earth Observatory.